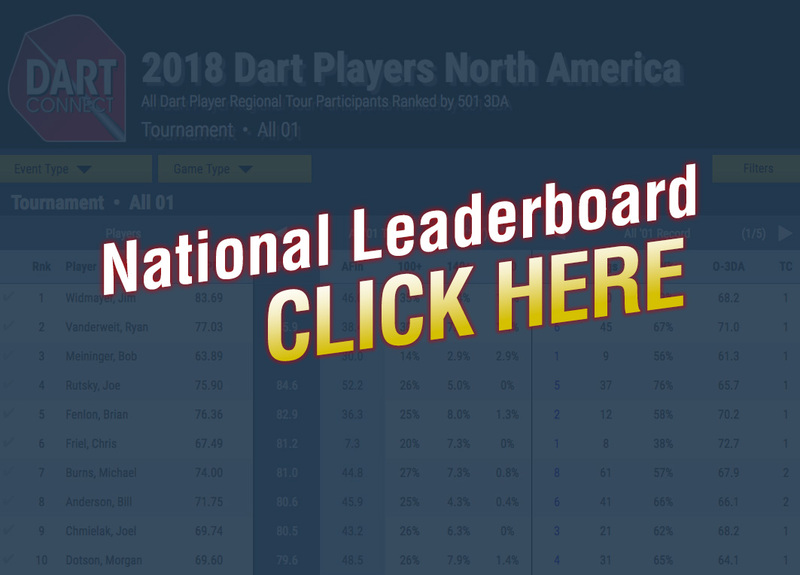 Dart Players North America is a framework for established and aspiring players to perfect their 501 game through long format, elimination competition – the international standard for darting excellence. Consistent regional competition prepares players for the highest level of competition without requiring long weekends, extensive travel and personal expense. You focus on your game, while DartConnect provides the resources required to run events effortlessly. Each region will have its own leaderboard, while the North American Leaderboard will allow players to measure their potential across the contintent. Get ready to Perfect Your Game. Looking to Start or Join a Tour? Fill out the form below to have someone contact you about starting or joining a tour in your region! Start a Tour in Your Area! Have a talented group of players who want to take their game to the next level? Start a competition series in your area, utilizing the DartConnect platform to maximize the player experience while simplifying the effort required for the organizers and event operators. Payout organizer’s option – visit the web sites for each area competition for best practices. Tournament Program: Load the players, make the board assignments, and DartConnect handles the rest: Every tablet has matches ready to go and match results are automatically returned to you. Running a tournament has never been easier. A small stipend to thank the enthusiasts who sacrifice far too much time and effort to allow the rest of us to enjoy our shared passion. At a minimum, this offsets the personal expenses they incur. Make sure you thank them & buy them a beverage, even when you are dissatisfied with your performance. They create the opportunity that we have the luxury of participating in. Already Have a Long Format Tournament Series? Consider aligning your competition with Dart Players North America, to ensure your competition AND players receive the attention they deserve. It is not a requirement that your event be renamed/rebranded. See the section regarding competition guidelines and contact us to discuss options. Regional play not enough for you? Can’t find enough quality competition in your area?